Have you ever been involved in an organization, business, church, or family that had more than one head leader? From my own personal experience, being in a situation like this is never fun. Major decisions can become delayed when there is disagreement between the two leaders. Or, resentment begins to build up when one leader caves in to the decision of the other leader. There is screaming, shouting, anger, and drama. I realize some people enjoy that, but not me! Anyway, a good friend of mine and I had lunch together the other day and we were swapping marriage stories - mine, his, and other mutual friends of ours. My friend had an extremely brilliant insight to marriage problems that I had never even considered before. He said, "Larry, in a marriage there can only be one president and one vice-president." I already know this right now. What I'm about to write in the remainder of this post is not going to be popular, especially with many women, wives, or ex-wives. But, I really don't give a rip, because I'm going to write truth based on God's Word. As Christians, we either accept His Word as truth or we don't. I do realize that there are a few instances in the Word in which we need to filter through Old Testament Law as well as the culture of the time that certain Scripture passages have been written. I believe that God's Word teaches that the husband has been appointed the head of the marriage, under the direct leadership of Christ Himself. 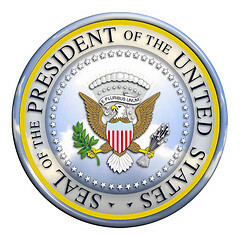 So, I guess if you really want to get technical about the whole issue, Christ could be considered the President, the husband the Vice-President, and then maybe the wife is the Speaker of the House or a Cabinet member if you chose to frame the leadership structure that way. Probably not the best analogy, but let's roll with it for now. So, the Apostle Paul compares the relationship of a husband and wife to that of Christ and His bride, the Church. Christ is the head of His Church. The church is supposed to submit the authority of Christ. In the same way, the wife is to submit to the authority of her husband. In today's world of women's liberation and rights, I know these are radical statements. Following the path of Jesus can lead to radical living, but in the words of Apple Computer, "It just plain works." When the husband has submitted his life to the Lord, then He is in the best possible position to lead his wife. The wife is then asked to submit to the authority of her husband. Does this mean that the husband leads his wife with a heavy hand? Of course not, but in the words of President Harry S. Truman, "The buck stops here." God is holding the husband ultimately responsible for the decision making in the family. At the end of the day, somebody has to make the final call, and God gives that responsibility to the husband. Let's revisit this topic in my next post.